My wife is progressing as a photographer at an alarming rate. Likewise, her progress through cameras is also frightening. From a crappy, purse friendly point and shoot, to her self-chosen superzoom (s2), to my hand-me-down-DSLR (300D), to her own DSLR (400D) at break-neck speed. Lately she has been lusting after precious Olympus C7070 mainly because of the 28mm (35mm equivalent) wide-end of its zoom that I use all the time. She needed a wide point and shoot, she argued. As I'd already lost my Canon 28-135mm IS lens and 8gb CF card in recent, similar arguments I had to do something fast before I lost my favorite digicam. I agreed to a new digicam without a second thought to sate my wife's wide-end lust. So what do you want as well as a wide lens? I want it to have a powerful telephoto like my Canon S2. Image stabilization, it should be small enough to easily fit in my purse, good low light performance, unobtrusive for street photography, a large LCD, low shutter lag, fast start up time, good macro mode, and easy to use. My wife is a demanding woman but 10 years together has taught me it is a waste of time trying to sell her short so I went on line trying to find a camera that fit all these requirements. 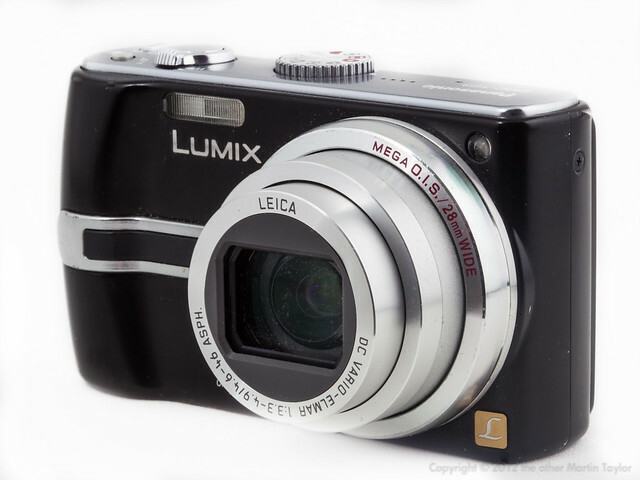 It turns out that, at this particular time (Summer 2007), there is only one camera that fits all my wife's needs; if you have similar needs to my wife the Lumix TZ3 is the camera to look at. Here's a camera that impresses right out of the box. Even before you put the battery in and turn it on the TZ3 exudes quality with its slim, metal body, classic rangefinder good looks, and that Leica badge means that this camera is dressed to impress. The first weekend she got the camera happened to be the first weekend after the iPhone had been released and we went to a friend's BBQ. Someone there had the iPhone but the TZ3 got as much, if not more geek love and attention than the long awaited apple product. Looking good is one thing but how does the TZ3 perform? Let's get some things out of the way first; the TZ3 is not a substitute for either my C7070 nor my wifes old S2. It cannot take RAW images and it doesn't have manual, aperture or shutter priority modes. Everything is controlled through the program mode and its many menu options, or the multitude scene modes. This gives you enough control to get what you want but, if this is your only camera, it might not be enough control for the enthusiast photog. However, if this is going to be an enthusiast's jacket pocket or purse camera when you don't want to carry your DSLR kit, or it is the family camera of a demanding user who just wants to get the picture, the TZ3 is, again, worth looking at.